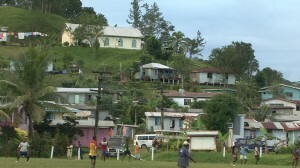 This is a short documentary about the village of Lutu in the Fijian highlands of Viti Levu. The village cooperation is exporting Dalo (Taro) to their supplier in New Zealand. Because of their commitment to the monthly supply the people of Lutu have a high rate of literacy, access to financial markets and financial independence. The production chain is very short. They have their own nursery for young plants, the crop is produced by themselves or being bought from other farmers and it goes straight to the buyer in New Zealand. The money groes back in the cooperative account from which the farmers are paid. The villagers contribute annually to a scholarship fund. The scholarship funds children from primary education up to tertiary education in Fiji and abroad. Lutu village has the highest number of University graduates in any Fijian village. The graduates have an advisory role in the cooperation decision making. A video about rehabilitating coastal habitats in Vanuaso Tikina on Gau Island. It shows the resource management work carried out by coastal communities of this island in cooperation with the University of the South Pacific. This partnership is called Fiji Locally Managed Marine Area (FLMMA) network.